Herein shall be explained the basic ins and outs of ESO Player Guilds, Guild Banks, Player Guild Stores, Public Guild Stores at Keeps, and other types of trading, selling and auctioning amongst players in Elder Scrolls Online. People have been asking about ESO Auction Houses too, so we will gladly give you the actual current facts on that also, along with other relevant ESO trading information. Player Guilds in Elder Scrolls Online are closely connected with in-game economy and trading, so I would like to tell you basic information about the Guilds first. You will understand why it’s so important to join guilds in order to trade successfully. Each ESO player is allowed to create and be Guild Master of one player guild per account only, but each player is allowed to belong to a total of five player guilds, four of which must be made by other players. It is easy to set up a Guild from the ESO ingame menu, which includes instructions; click on the Shield Symbol to create a player guild or to access your guilds, and to set your permissions for your guild bank and store. You can also search for guilds or groups to join with the magnifying symbol search feature in your ingame menu. The player guild you create will count as one of those five player guilds you can belong to with your account. The Player Guild you make and those you belong to, become associated with your account; not just with one of your player characters, but also with your alternate characters who will also have access to those player guilds. Each Guild has a particular allegiance in the Alliance Wars. For example, you can create only one player guild, so you should choose for it, the Alliance that your main character comes from and will most want to fight for in the Alliance Wars with other players. If you have the Explorer Pack, you can play any race in any alliance, but even-so you will have chosen that character’s alliance during character creation and can create a player guild for that Alliance. ESO factions for Alliances are the Aldmeri Dominion (AD), Daggerfall Covenant (DC), and the Ebonheart Pact (EP). Some player guilds are set up to invite players from either the EU or NA Server, and others do not care where the player is from, but look for other commonalities. However for the purposes of trading, it is possible that a player could belong to any of the player trading guilds they want to, as long as they only belong to no more than a total of five player guilds per account. There is nothing wrong with having a Guild you prefer for close allies for fighting in the Alliance Wars, and then for the purposes of large-scale trading, also joining a large player created merchant guild. This is allowed by ESO. Each player can be a member of up to 5 guilds. Guilds are bound to your account. Members of different factions can belong to the same guild. A Player Guild is allowed a Guild Bank of 500 Slots, once enough players have joined that guild to make a total of at least ten (10) players belonging to that guild. A Guild Master should choose a Guild Officer (like a First Mate) whom they can trust and get along well with, to help lead the group. Other players, who join the group, start out as Recruits and as they gain trust; they can be promoted to Members, at the discretion of the Guild Master. Guild Masters generally want to promote players that show positive interest in the group and in helping other players in the group. The Guild Master, sets permissions for the Guild Officer and other ranks, and may allow the Officer permissions to help set other permissions too. When your Guild Bank is set up, you and those guild-mates given permissions to it, will be able to access it at the same ingame places that they access their regular bank. The Guild Master and/or Guild Officer will initially decide when the Bank is ready to be opened-up to which ranks and they may choose to wait to open it to all members, until they have enough players joined to the guild to be able to open the Guild Store, or they may open it to all guild-mates as soon as they can. This allows participants in the Guild the opportunity to either give away gold or items to the Guild and its participants for free, by depositing them in the Guild Bank – or by selling them in the Guild Store. Although if and when the banked items can be deposited or taken out from the Guild Bank by any others in the player guild, a record log is still automatically made showing who has deposited or withdrawn from the player guild bank, which helps clarity. This also discourages people from just joining a guild to pillage its bank and then taking off, to sell it all elsewhere – or from just anonymously dumping off hundreds of the same zero value items to take up all the bank slots. Various Guilds may have different ways off running their bank, for example some may use it for saving up and gearing up for an Alliance Campaign, others may use it to store prizes and gifts for Guild Members and yet other guilds may use it for all out casual sharing with other members at any time. Player Guild participants want to help their guild allies and so another good use for the bank could be when a member who makes armors for other guild members may want to deposit some armor/s in the bank for members to pick up before a major Alliance Campaign. The Player Guilds Alchemist may in turn want to deposit potions in preparation for war, and so on. In this case the bank may be set to deposit only, till the supplies are in place and then opened for withdrawals right before participating members are preparing for heading off to war. However the Player Guild Bank is not an Auction House or Store. If you put something in a Guild Bank you are not selling it -- you are gifting it – even if you do take out an item of comparable value whilst there, instead of trading with another player directly. Regardless of how a Guild’s Bank permissions are set at any given time, or how the bank is used for any given player guild - those who have not joined a Player Guild cannot deposit or withdraw from that Guild Bank. If you put something in a Guild Bank you are not selling it -- you are gifting it. If you want to list an item for selling - use Guild Store. To open and use a Player Guild Store you will need to have at least fifty participants joined into your Player Guild. If that player guild membership later drops low enough, you will be able to complete already posted transactions; but will lose some of the functions of your store for more new transactions until the membership rises again. You will be able to access your Player Guild Store, the same way you access your Bank, and Guild Bank. The big difference, between a bank and store is that if you want to sell your items instead of giving them away, your can use your Player Guild Store. Guild Store is the only place where you can list your items for selling. It is a marketplace of ESO where players can trade. Each player can be a member of up to 5 guilds and thus access up to 5 Guild Stores for selling items. It is very easy to buy and sell in your Player Guild Store with other player guild-mates. A log of transactions is automatically kept for you, so that your store runs smoothly and people usually seem to get along quite well buying, selling and trading with other guild-mates in friendly player-guilds. Right now there are no Auction Houses in ESO. But what’s the real difference between Auction House and Guild Store? The only difference is a method of trading. Auction House in most MMO games allows 2 options: to list an item at a fixed price or to set starting price and let buyers to make bids. In Elder Scrolls Online you can sell an item at a fixed price only. The second big difference is that Auction House is usually server-wide. All players from the server can list items there. In regards to ‘Auction Houses’ -- ESO wants to have a player-based economy dependent on players themselves, and a group and guild friendly economy based and what players are able to find and make by playing the ESO game, and to share, trade or sell amongst allies with those bonds. This is one of the reasons why ESO does not currently have all-out Auction Houses. For example, if there is a rare item that can be obtained ingame and then with so many people on a megaserver multiple versions of an otherwise rare item end up in Auction Houses, for everyone with the coin to just buy it instead of finding or questing for it ingame; that item no longer carries the prize value it once had and the incentive to win that item by exciting ingame actions is diminished. How to Access Guild Store? You will need to be a member of a Player Guild, to buy or sell at your Player Guild Store. However, there is currently one legitimate exception to that, which is earned through a great deal of challenge and excitement indeed. This legitimate exception is that, if your Player Guild (or one that you belong to), wins an Alliance War Stronghold, then you will be able to have your Guild Store featured as a Public Guild Store at that Keep. Your Guild will have to hold on to that Keep for your Alliance, if you wish to keep your Public Guild Store there. If you lose that Stronghold, then some other winning Player Guild and their Public Guild Store will have their turn to be featured there instead. If you win it back, you will be able to feature your Public Guild Store at that Keep again. Public Guild Store allows any player to buy stuff from that guild store. But only members of the guild that owns the store can sell items there. 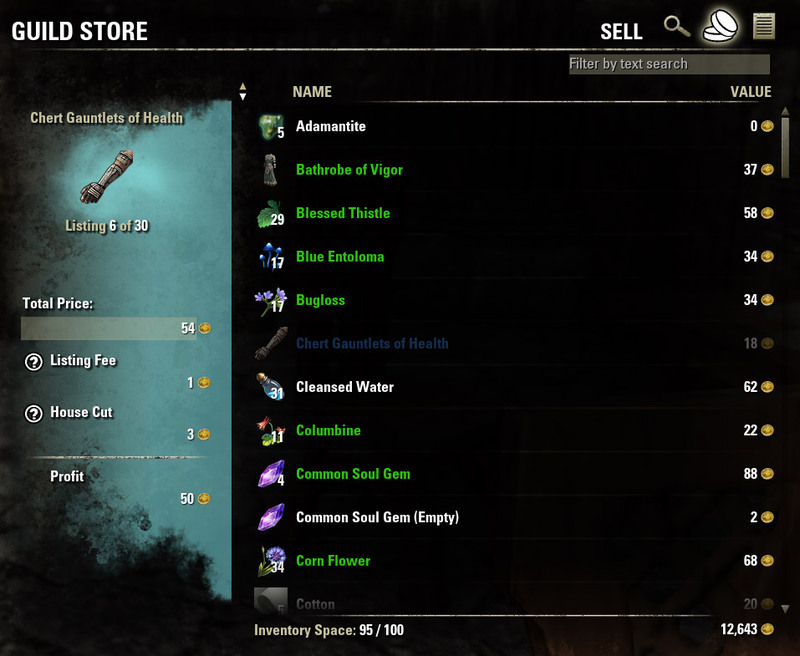 So if you want to buy something from big and established guild visit guild store in one of the Keeps in Cyrodiil. As you can now see, although you can have a Player Guild Store and even have a chance to feature a Public Guild Store at a Keep by winning a stronghold in the Alliance Wars -- Nevertheless, there are currently NO official ESO ‘Auction Houses’ ingame. Some people have asked for them, but ESO has given some logical reasons why they think this may not be good for the gameplay – and so far have not included ‘Auction Houses’ per say – but prefer the well-won Public Guild Store option. The way that some players have somewhat gotten around this -- is to set up large trading player guilds and though some of them may use the word/s Auction or Auction House in their title – however these are not really official ingame ‘Auctions Houses’. Player Trading Guilds in ESO will have different rules and ways for you to trade that they can share with you, but if you choose to search anywhere else online for ESO Auction Houses, be aware that so far these are not official ingame Auction Houses approved by ESO! -- So if you choose to buy and sell with them in any way (including with real money), you will be doing so, solely at your own risk. If ESO ever does introduce ‘Auction Houses’ ingame, for sure they would give us official notice. Have fun trading in ESO, but do be careful elsewhere out there, ESO Friends. Another way that people auction off items in ESO is to announce they have an item for sale with the item name and asking amount mentioned on the ingame chat-box. For example, they may type (without repeatedly spamming it), something like; ‘Racial Motif: Woodelf (Bosmer) 500g or best offer…PST me with offer’. This means the person will trade that item for 500 ingame-gold, or may accept a bit more or less if offered. If the item is sold, the player characters meet ingame and make the trade, or they may choose to do it CoD (Cash on Delivery) via ingame mail. 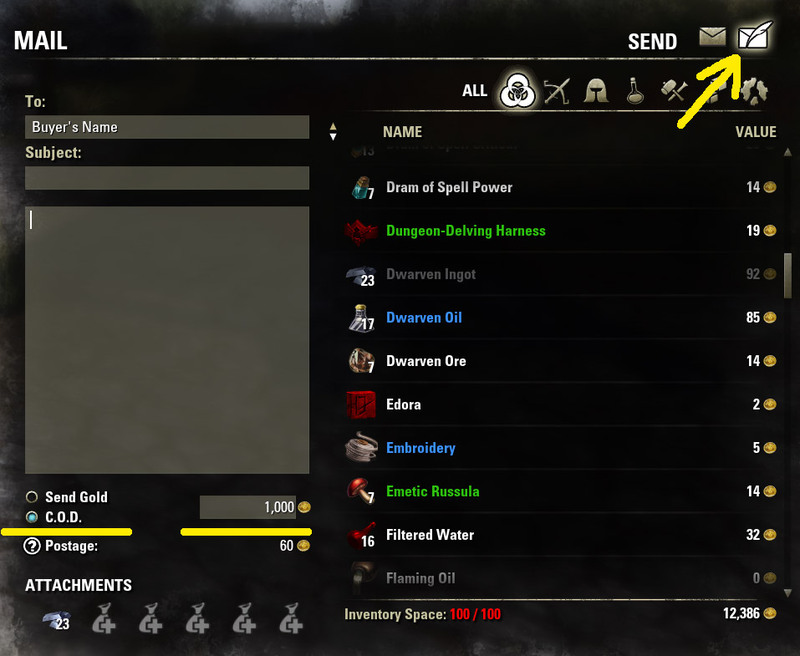 Ingame mail allows people to send gold or attachments to their contacts. So far we have not seen any complaint with that, however alternately if someone repeatedly spams the chat with www internet links for gold selling to get ingame gold; they may get reported right away. There are types of websites online that offer to sell game-cheats or ingame gold in exchange for real money, so players should be careful not to believe these scams. Those kinds of sites are NOT sanctioned by ESO. CoD is a special system that allows players to trade without risk of losing items or losing money. This system is a part of the game and protects both buyer and seller. If the item is sold a seller may send an item to a buyer using CoD system. All you need is to attach an item to an in-game e-mail and specify special CoD Price. After the e-mail is delivered a Buyer will see it among other incoming e-mails. A Buyer can open the e-mail to see an attachment but can’t take the attachment without paying a CoD fee. When a buyer takes an attachment the game will notify him that he will be charged. If he agrees to pay he receives an attachment and seller receives the money. As you see it’s a very simple and useful system. There is one thing you should also know: when you buy an item using CoD you will most likely pay postage fee. This fee may sometimes be big, especially if you buy expensive items. All sellers usually include postage fee in the CoD price. So if the item cost is 1000 gold and postage fee is 60 a buyer will pay 1060 CoD price. The only advice I can give you: check the item before paying. Make sure you are purchasing what you need. CoD system allows you to open the e-mail and examine the attachment before you pay. Double check the attachment before taking it. We hope this guide has helped you get some clarity of the facts on Player Guild Banks and Stores, Public Guild Stores at Keeps, and the good, the bad and the ugly of other kinds of Trading and Selling – so that you can have as much of a fun experience with trading and sharing in ESO as possible. Please feel free to leave any comments or suggestions for other players. Happiness on you All!